^ Chang, S.-C.; Gao, K.-Q. ; Zhou, Z.-F.; Jourdan, F. (2017). “New chronostratigraphic constraints on the Yixian Formation with implications for the Jehol Biota”. Palaeogeography, Palaeoclimatology, Palaeoecology 487: 399–406. doi:10.1016/j.palaeo.2017.09.026. http://www.sciencedirect.com/science/article/pii/S0031018217304832. ^ Xu, X.; Norell, M. A.; Kuang, X.; Wang, X.; Zhao, Q.; Jia, C. (2004). “Basal tyrannosauroids from China and evidence for protofeathers in tyrannosauroids”. Nature 431 (7009): 680–684. doi:10.1038/nature02855. PMID 15470426. http://www.geo.arizona.edu/geo3xx/geo308/FoldersOnServer/2004/nature02855.pdf. ^ Carr T.D. ; Williamson T.E. (2010). “Bistahieversor sealeyi, gen. et sp. nov., a new tyrannosauroid from New Mexico and the origin of deep snouts in Tyrannosauroidea”. Journal of Vertebrate Paleontology 30 (1): 1–16. doi:10.1080/02724630903413032. ^ Loewen, M.A. ; Irmis, R.B. ; Sertich, J.J.W. ; Currie, P. J.; Sampson, S. D. (2013). Evans, David C. ed. “Tyrant Dinosaur Evolution Tracks the Rise and Fall of Late Cretaceous Oceans”. PLoS ONE 8 (11): e79420. doi:10.1371/journal.pone.0079420. PMC: 3819173. PMID 24223179. http://www.plosone.org/article/info%3Adoi%2F10.1371%2Fjournal.pone.0079420. ^ Brusatte, Stephen L.; Carr, Thomas D. (2016-02-02). “The phylogeny and evolutionary history of tyrannosauroid dinosaurs” (英語). Scientific Reports 6 (1). doi:10.1038/srep20252. ISSN 2045-2322. https://www.nature.com/articles/srep20252. ^ Kundrát, Martin; Xu, Xing; Hančová, Martina; Gajdoš, Andrej; Guo, Yu; Chen, Defeng. 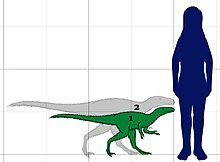 “Evolutionary disparity in the endoneurocranial configuration between small and gigantic tyrannosauroids”. Historical Biology. doi:10.1080/08912963.2018.1518442.